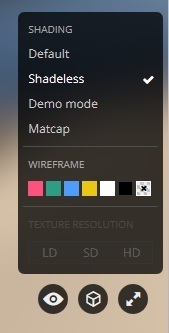 Can anyone help me understand why I can't choose texture resolution? The normal problem is just a warning, don't worry too much about it. We'll try to fix the bug asap. Also, note that each time you change a setting in the editor and resave your model, we'll regenerate all the textures. So, if you edit your model, save, and wonder why you lost the "hd button" it's perfectly normal and means you have to wait for it a bit. Don't hesitate to paste the model's url so that we can see if there's another issue than the one I mentioned ?